Another give away (this time it's personal!) - Stop staring and start sewing! Last year I was asked if I would be interested in contributing a project to a beach themed book by Stash Publishing (an imprint of C&T). 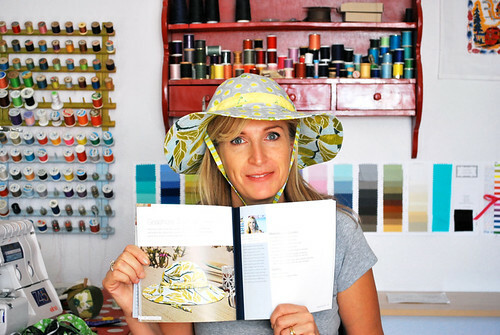 Then acquisitions editor, Susanne Woods, asked if I would create a pattern for a sun hat and although I said "Yes, I'd love to! ", in my mind I was thinking "Is she crazy? I don't DO hats!". But hey! Why pass on a great opportunity, right? So after a week of mulling and sketching I submitted this idea for consideration. My goal was to create a reversible hat so you'd basically have 2 hats in one. I wanted a brim that would hold it's shape while not being too stiff and a crown that was soft but not floppy. Mission accomplished. The seam is hidden along the brim so there's no "bad side" with this hat. When you want to change the look simply flip it over, pull the strap through the gap, and tighten the toggle under your chin. Fabric used is from Laura Gunn's Poppy Collection. You can use a bead or cord lock for your toggle, but if you want a really beachin' hat you can get one of these mini-conch shells and use that instead (I bought a small pack of them at Michael's). Okay, so here it is back on my head after spending months in California getting it's picture taken. I'm keeping the hat but giving away a copy of the book (I'll even sign it for the winner)! 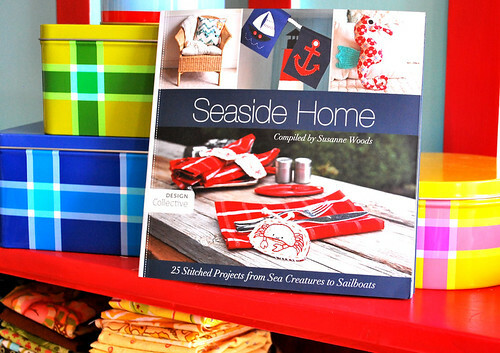 There are a total of 25 great projects in the book including softies, home decorating, children's wear and more. Great gift ideas here! And you don't even have to live near a beach to enjoy all the cuteness stuffed into this book. So check it out here at Stash Books (and a great version of my hat in this post here). Just leave a comment and I'll draw a lucky winner next weekend (on April Fools' day, but I'll seriously send the book!). Have a wonderful week!